Last August I posted Using the Power of Story for Fat Loss, which I think is one of the more important posts on this site. The short version is that if we can wrap the complexities of an effective diet into a simple story that inspires us and aligns with our values, it has a much higher chance of working. For me, I developed the Peasant Diet. This is a diet of simple cheap foods that are higher in volume and lower in calories. The Peasant Diet is not a modern poverty diet. Potatoes, not Doritos. It worked for me because not only did I drop calories, but because it saved me time and money, both which are important to me. You can read the full story at How I Used the Peasant Diet to Lean Out. The story was working. Everything was going strong. Then came my injury on September 19th. It didn’t affect my diet at first. But after a few months, it was clear my injury was not getting better. It was getting worse. So in addition to starting physical therapy, I reduced my daily steps from 10,000 to around 5,000. The progress I was making most of 2017 came to a halt. My story was no longer as strong. Instead of being the Peasant walking across my village, I was the modern man at home sitting in front of my laptop. Then in late November, I read the book Nutrition for Injuries by Lyle McDonald. The takeaway lesson I got from that book was that I needed more calories to heal from my injury. Eating like a Peasant was likely hurting my recovery. I will absolutely be eating a higher calorie diet rich in dairy protein during this recovery and future ones. By pausing the story and eating more calories, especially dairy, I knew the risk was I could gain weight if I got the calories wrong. But since my primary goal was getting my knee health 100%, I accepted the risk. Increased rest and increased calories didn’t work. Nor did PT. Instead of the extra calories going to make my knee better, I gained 6 pounds (197 to 203). Considering I started at 222, I’m OK with the risk I took, but I’m pulling the plug on the higher calories for healing plan. My story for fat loss was solid, right up until I got injured. Then it got weak because my primary goal shifted. The good news is I caught this quickly. This week I have been thinking about every time period where I made measurable progress in health and fitness and every time I slipped. The times I did best were times when I was following a simple story. The times I didn’t were when the story got weaker. A weaker story is not necessarily bad, especially if there are flaws in the story. The lesson I want to share is that without a strong story, motivation and compliance will fall. Find a new better story if the old one is no longer working. I’m ditching the majority of these dairy calories I’ve been consuming the last two months. I’m returning to Peasant. Potatoes, grains, legumes, eggs, etc. I’m highly motivated. I don’t like the idea that I spent all that extra money on food only to gain weight. Eating cheap to get lean aligns with my values best. For my knees, I have accepted that I may never get to 100% healed. I’m trying new exercises thanks to a few commenters. Maybe they will work, maybe the won’t. Time will tell. Another plan that aligns with my Peasant Diet is to use the Fasting Mimicking Diet to increase the production of stem cells in my body. I’m hoping that tripling the level of circulating stem cells will speed my healing. But even if they don’t assist with the knee recovery, they still have a lot of other benefits and I’ll save money those 5 days. Win, win! My story is strong again. 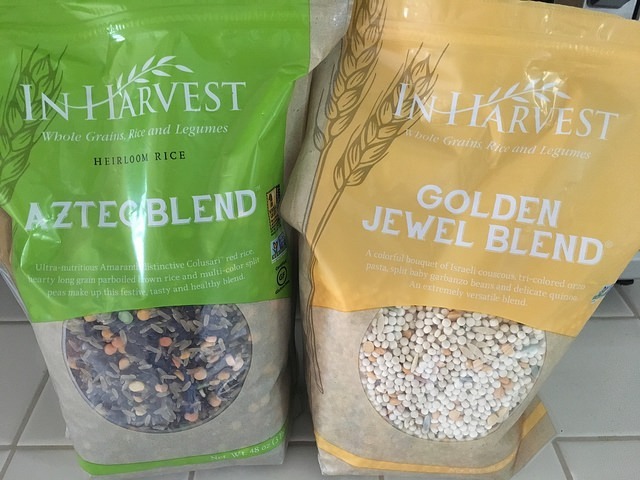 My latest Peasant discovery are these whole grain mixes I found at Cash & Carry. I got both for around $15 total. Watching these simmer for 35 minutes is no fun, but this week I cooked both via the pressure cooker in about 8 minutes. Saving money and time. Pure Peasant! I love your peasant diet, it’s so good on so many levels. I’m no expert on injuries, but what I’ve heard on various podcasts is that collagen is important. Masterjohn talked about a method of getting the collagen into the tendons from some study. Take collagen (hydrolyzed/peptides) together with vitamin C 20-30 min before workouts. The idea is to have collagen amino acids in the blood when working out, when the tendons gets more blood flow. This is a window of opportunity, because the tendons normally does not get much blood flow, and therefore supplementing other times is a slow way of rebuilding tendons. It was measured in the study to get significantly more collagen into the tendons. FWIW, I noticed a difference instantly on my sore Achilles tendons. But perhaps a knee injury is a different story. @Robert – That is super interesting advice. I have just used most of a tub of collagen peptides with no benefit, however, I was taking it after working out. I will use the rest per your tips. Thanks. @MAS – Maybe you should listen to the podcast also, I’m probably misremembering at least some detail. Mastering nutrition with Chris Masterjohn, episode: “Collagen before your workout for tendon health”. It’s a short episode. The study was also discussed in Sigma nutrition podcast episode 143, where there seem to more information about injuries as well. @Robert – Listening now. Thanks! To be compliant with fasting requires a good “story” whether the fasting is intermittent fasting, a water fast, a Fasting Mimicking Diet (FMD), or a Do-It-Yourself Fasting Mimicking Diet (DIYFMD). DIYFMD is my term for an imitation FMD that does not involve the Prolon meals and doctor supervision. I have completed two 5-day cycles of DIYFMD so far, and I am happy so far with the results in that I have lost about 5 pounds and I FEEL GOOD! There isn’t any version of fasting which is easy, but FMD and DIYFMD are probably the easiest, and they might be the most beneficial type of fasting. Having a “story” that great benefit is coming from fasting helps a faster persevere when experiencing a reduction in energy, physical symptoms, and/or mental symptoms. @Mark – Well said. I’m on Day 2 of my first FMD. Before I started I wrote down the reasons I was doing it and then read them a few times. It has helped.